No matter what age I am I still get a kick out of seeing bubbles float in the air. My 3 year old is mad for bubbles and would play with them all day long. If allowed to choose a treat in the shops it will normally be bubble related. 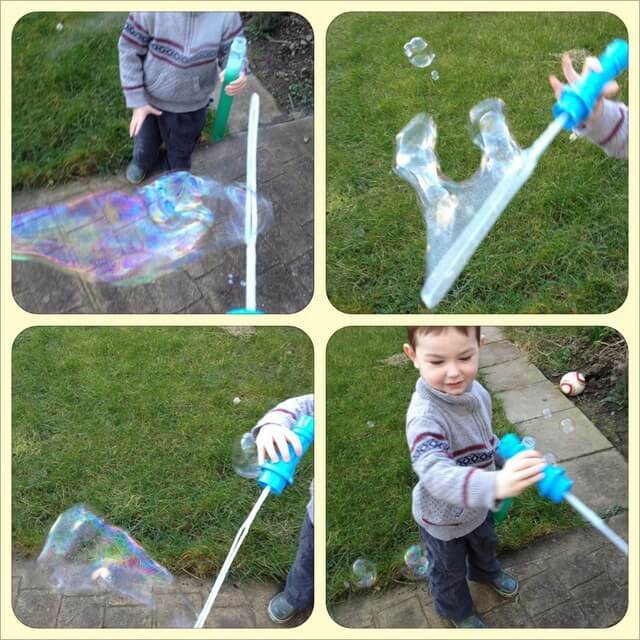 He has a “lawnmower” that trails bubbles behind him as he trots up and down the garden behind his Dad, he will ask for extra bath mixture before getting into the tub so that he can make himself a wig and a beard from the bubbles, you get the idea. Bubbles are transient, caught in a moment in time, suspended in the sky for as long as they are stable, and then in a puff of wind they are gone. To keep the young master in the style to which he has become accustomed would cost us a fortune. He has a wand/sword with sheath for blowing big bubbles that only requires him to swing it towards the wind to get a great sized one. It takes 200ml of bubble solution and if he even slightly tips against it it is emptied onto the grass and the tears begin. With a baby in the house I’m not likely to be making regular trips to the supermarket to feed his bubble addiction so it’s good to know that I can simply lash a solution together using ingredients from my stores. It is extremely stable, the bubbles from this mixture will resist even a strong breeze and, if it is below freezing outside you can use this mixture to make frozen ice bubbles. Carefully pour the 3 liquids into the bottle. Screw the cap tightly shut. Shake the bottle well to combine the ingredients. Store in a dark place for at least 24 hours, if not more before using. I would never have known to add glycerine but for your post…This is not the first time one of your ‘recipes’ has saved the day in this house!!!! I hope this will be included in your book! Glycerin makes HUGE bubbles. Have fun!